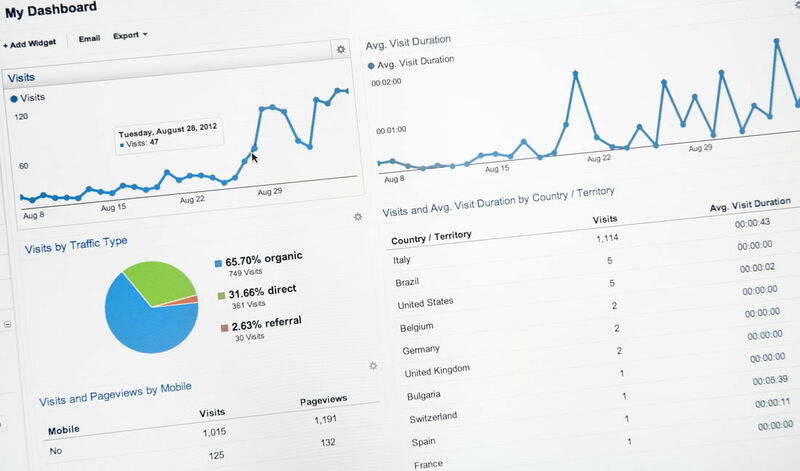 If you haven’t explored what Google Analytics can do, you’re missing out on valuable data. Google Analytics is an incredibly detailed resource – available free to every website owner. Perhaps you’ve looked into Google Analytics before and it seemed confusing; don’t worry. We’re going to explain in plain language why you should use Analytics in your business. Read on for what Google Analytics can do and what the information tells you about your business. Plus 5 top tips for using Google Analytics to increase sales in small businesses. Let’s dive in. What can Google Analytics tell me about my website? The first step is to connect Google Analytics to your website (or ask your web developer to do it for you). How many website hits am I getting? If your website is a business-to-business service, most likely you’ll get more website hits on weekdays than on weekends, and more hits on desktop than mobile. This is because your customers or clients are viewing your website at their desks on workdays. Retail, fashion and gift stores often get more hits in the evening when people are relaxing and doing some online shopping. Restaurants usually get more website traffic around mealtimes and from people searching “near me”. If online sales are slow, low website traffic could be the problem; maybe customers simply don’t know your website exists, so you need to help them to find you. Investment in organic SEO makes a huge difference to your website traffic because more targeted website content helps customers find your business in search results. Click here to find out more about boosting sales through SEO campaigns. If you’re getting 2,000 website visitors a day, but only 2 sales a day, your conversion rate is struggling. 2,000 people found your website and clicked on it, but they just weren’t convinced enough to buy, so you need to improve your message. Do you explain the features and benefits of your products well enough? Do you have a compelling call to action asking them to buy your product? Consider talking to a conversion copywriter; improving your website content can help you turn missed opportunities into sales. Track your conversion rate by comparing website traffic data with completed sales. If you run promotions and see big spikes in traffic, note those dates in Google Analytics to remind you when you held the “30% off all knitwear promo” for example. Experiment with different offers to see which ones increase your conversion rate. You might find that “free shipping” or “bonus with purchase” offers make huge spikes in your sales. Because it tells you how your customers found you. Google Analytics makes it easy to compare how many visitors found your website via organic search versus paid ads versus other websites. This helps you understand which traffic sources are already successful, and which sources need attention and improvement. Think about popular and relevant websites that you could ask to place a backlink (that’s a link to your website from theirs). Let’s say you sell children’s toys: write a post about “5 best gifts for kids who love dinosaurs” with links to your products, then send it to parenting blogs with big readership. They’re always hungry for content. Or if you’re a physio, write a guest post about common exercises to strengthen back muscles with links to your website for more info, and send it to GPs to include in their patient newsletters. Write a helpful and informative article with a catchy headline to get loads of clicks. Which of my website pages are the most popular? If people spend an average of 4 minutes reading a blog post, they’re probably reading the whole page and enjoying the information. If the average time is 30 seconds, it’s not interesting to them. If 80% of visitors land on a page and exit in a few seconds, it means that page isn’t engaging. This is called a high bounce rate. If you notice that a lot of people abandon their shopping cart on the shipping costs tab, perhaps your shipping costs are too high. Otherwise, customers may have been trying to find out how much shipping would cost because they couldn’t find the information elsewhere. Consider adding shipping cost information earlier in the buying process so they have time to think about it – and to avoid a shock on the purchase page. A high exit rate on a “thank you for buying” or “payment successful” page means you are onto a winner. Your customers are happy because they’ve got exactly what they wanted. Look at pages with high bounce rate, high exit rate and low average time on page. Is the message clear and compelling? Is your website mobile responsive and easy to read? How can you improve the message? Do you have a clear call to action? Visitors need to be asked and reminded to take action. There’s a nifty trick to track visitors who arrived via Facebook ads and shared posts. A Facebook pixel is a line of code embedded on each page of your site, which follows visitors all the way from entry to exit. Because you can track return on investment (ROI) from your social media efforts. You can see which pages they read, how many pages they viewed and whether they browsed or ended up buying. If you can see that 126 sales in the last month came from your Facebook promotion, you can assess the profitability of that promotion. Here’s an article about what the Facebook pixel can tell you about your customers and your website, and here’s a technical link about how to install the Facebook Pixel. If you see a lot of referrals from Facebook but not many from Twitter, why is that? Perhaps your target customers aren’t on Twitter, and you’re better off focusing on Facebook instead. The truth is, Google Analytics gives you a lot of data and will probably create a big to-do list of ideas and possibilities. As a small business owner, you don’t have to do everything when it comes to social media. In fact, it’s better to do one social media platform well, than to do 4 platforms poorly. Cut back your focus to doing one platform, nail it and get a good ROI for your time and effort. Which devices are my customers using? Google Analytics tells you how many of your customers view your website on desktop, mobile and tablet. 5. A high bounce rate on mobile devices probably means your website isn’t mobile responsive. Look at your website on a variety of different mobile devices and see how you find it. Is the website easy to read, easy to navigate and easy to buy something or fill in a contact form? If not, your website isn’t mobile responsive and needs to be improved for mobile user experience. Ask your website developer to set up Google Analytics for you, or follow the steps to set it up yourself. If you have Google Analytics set up but you haven’t started using it, you’re in a strong position with plenty of history – it’s just sitting there waiting for your attention. Set aside a couple of hours to dig into the data and see what you can discover about your website. Put changes into action to increase sales through your website. If you need more help to interpret the data, ask your website developer for a tutorial session.